"So long as signs continue to point to a growth-driven move in yields, we think that over the medium term, stocks will fare well," Bernstein's Weisberger writes. Benchmark 10-year yields are up more than 10 basis points over the last two sessions to their highest level since 2011. More competitive returns for holding government debt erode the marginal benefit from stock dividends and increase corporate borrowing costs. Rising borrowing costs have scores of stock traders worried that more expensive debt could dampen corporate profits and the economy, sending the major stock indexes down sharply Thursday. But others — like AB Bernstein's top equity strategist — believe the latest sell-off in equities will give way to gains through the end of the year. "When yields experience large changes in short periods of time, stocks can struggle to digest the moves," Bernstein's Noah Weisberger wrote Thursday. But "so long as signs continue to point to a growth-driven move in yields, we think that over the medium term, stocks will fare well," he said. The strategist said that the technology and financial sectors often outperform in a rising rate environment. "In fact," Weisberger added, "we would argue that financials — particularly banks — have been held back over the last several months, with scope to catch up to where yields are already." As one of the only bright spots in the market on Thursday, nearly all of Wall Street's top bank stocks added to strong week-to-date gains. The Financial Select Sector SPDR exchange-traded fund is up 2 percent this week. 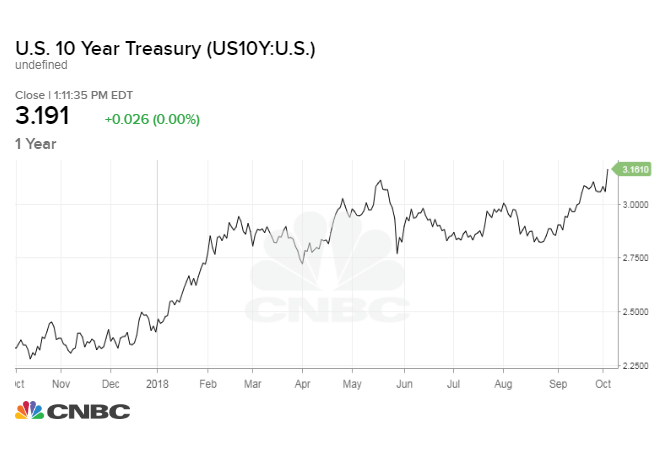 Weisberger's optimistic call may sound counterintuitive given the rise in borrowing costs over the past two sessions, with benchmark 10-year yields climbing more than 10 basis points to their highest level since 2011. Investors often assign additional importance to the 10-year yield, which can impact everything from mortgages and credit cards to corporate loans. The Dow Jones Industrial Average shaved off more than 120 points off Wednesday's highs in the aftermath and fell more than 200 points Thursday. Higher bond rates can also hinder stocks in certain sectors, including utilities and real estate investment trusts (REITs), which investors often hold for their sizable dividends. More competitive returns for holding government debt — as well as inflation — erode the marginal benefit from holding those types of stocks. REITs, consumer discretionary and utilities stocks are the three worst-performing stocks in the S&P 500 over the past month as the 10-year rate soared more than 30 basis points. The sectors are down 4.8 percent, 2.9 percent and 1.1 percent, respectively over the last month. But Weisberger holds that the gut reaction to higher rates shouldn't distract investors from what is otherwise a healthy economic forecast. "Higher yields tend to be positively correlated both to stock returns and to measures of economic growth, indicative of the direction of causality running from economic outcomes to markets," he wrote. Recent economic data – such as historically low unemployment and expanding corporate profits – have not only ushered stocks back to all-time highs in recent weeks, but also helped the Federal Reserve justify its third quarter-point increase to the federal funds rate in September. The central bank also upped its anticipation for economic growth this year to 3.1 percent, citing manageable inflation and an unemployment rate of 3.9 percent. "Good news for the economy is good news for stocks and credit sectors in the bond market," Jeffrey Cleveland, chief economist at Payden & Rygel, told CNBC in an emailed statement. "It appears that, yes, the latest move has been driven by positive surprises on the economic growth front." "However," he added, "the trick is deciding in real time which forces are actually at play on rates! Is something else afoot?" Cleveland offered Fed Chair Jerome Powell's comments Wednesday as another possible explanation for the rise in rates. Powell said in an interview with PBS that U.S. monetary policy is "far from neutral," suggesting front-end rates have further room to rise and that monetary policy is not yet restrictive as a possible alternative explanation for the recent uptick. Jerome Powell, chairman of the U.S. Federal Reserve, pauses after speaking during a news conference following a Federal Open Market Committee (FOMC) meeting in Washington, D.C., U.S., on Wednesday, March 21, 2018. The surge in rates may also be thanks to a swell in Washington spending.